Disclosure: Cute Fall Outfit Idea from Simply Be is a sponsored post; however, all opinions are my own. Another fall is almost here. That means, for a lot of us, it is time to update our fall wardrobes. 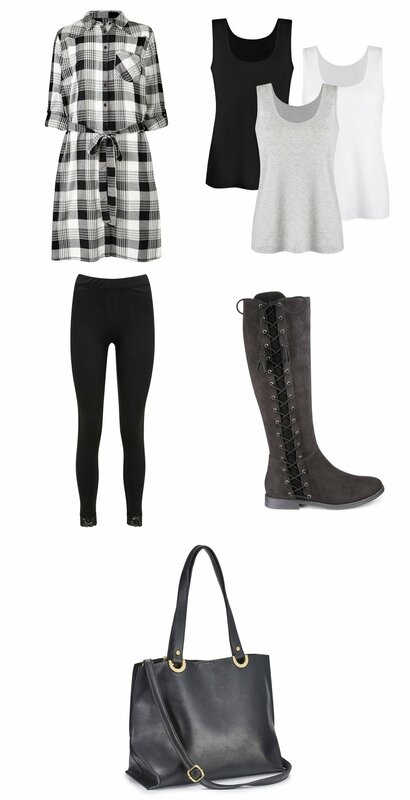 I’ve got a cute fall outfit idea with versatile pieces that you can wear together or with other outfits. I love all of these items because they could go with so many outfits. Make a style statement in this check shirt dress. The long-sleeved dress features classic button-down detailing, front patch pocket and a relaxed tie waist. Style with ankle boots for an effortless everyday look or wear it open with jeans and a tank. This pack of three tank tops are great for layering or for your vacation wardrobe. It has a great fitted shape with a flattering round neck and thick straps. These are a cute basic legging with some lace trim for added flair. Joe Browns bring you the latest offering in quirky, fun footwear. With lace-up detailing on the side, these are available in 2 width fittings and 2 calf fittings. This great value shopper handbag is a sophisticated way to carry all your essentials, it comes with an additional across body strap and can be worn a multitude of ways. At Simply Be, you’ll find the latest plus size fashion clothing available in sizes 8-28. From plus size jeans and dresses to trendy tops, Simply Be’s women’s clothing features fashionable outfits for every occasion. Find fabulous plus size dresses including cocktail dresses and sundresses. Also shop their great selection of plus size jeans from curve-loving skinny jeans to figure-flattering bootcut jeans. They also carry a fabulous line of wide width shoes for women and other trendy accessories. What is your favorite piece from Simply Be? Come back and let me know! I really like the blouses and slip on shoes. So many great things to choose from and in my size.